Okay, so I'm posting the winter collection before the fall collection.... Cause... frankly... I'm a lot more excited about this one! You'll see why in just a moment. This is a collection of four vampy shades for winter and they're not just the traditional red-burgundy-brown type shades! Black Ice. Very dark black creme with sparkly silver glitter. OOOOOH! GLITTER!!! 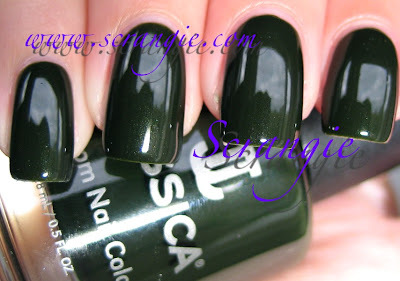 Jessica is a very new brand to me and I really had no idea they did cool shades like this. Pleasant surprise, really! Anyway, I've mentioned before that I'm not normally a fan of the black/silver combo. The black ends up looking dull because the silver is not usually shiny enough. However, I've recently found three polishes that have changed my mind, and this is one of them. The silver glitter is dense and very shiny... Sparkly... twinkly... The black looks very black and the silver looks very bright. Perfect. Divine Pine. Dark yellow-toned green with hidden shimmer. (Please excuse the scratches and tipwear, photo was taken after two days of wear) GREEEEEEEEN!!! And a very nice one at that. It's nearly-black, but it looks different than a lot of the similar colors. It's darker than BB Couture Green Goblin but lighter than OPI Here Today Aragon Tomorrow or Zoya Envy. I included the second picture with the flash to show the base color and the hidden shimmer. It's not a blue-toned as Sephora By OPI Dark Room. It does look mostly black indoors but outside it's a vampy green. I adore this. Not too dark, not too blue, almost exactly what I've been looking for. And no, it looks nothing like Zulu. Frost At All Cost. Dark dusty peacock creme. This is an unusual shade. It's a very dusty green-blue... I've seen this color referred to as "peacock blue" and I really think that fits. It's dark but not black. Pretty unique as well, I can't think of a whole lot of colors similar to this... Although, it is very similar to Fishnets and Fringe from the Burlesque (fall) collection. The formula on these is not flawless, however. I don't know how Jessica formula 'normally' is, but these are thicker than the first ones I tried. They're quite thick but very opaque. I did have a bit of trouble controlling these. The drying time on these is also very long. I've tried them with Seche, Poshe and Diamont quick-dry topcoats and while they do 'set' very quickly, they remain dentable for over an hour. They do eventually dry completely, just not as fast as I'm used to. But, neither of these flaws are pronounced enough to make me want to avoid the polish. LOVE the look of Frost At All Cost! Love Frost at all cost! I think all of these are must haves! All these colors look so pretty! I think I would like Frost at all Cost better if it had a bit of shimmer to it. I like the shade but I end up hating how cremes look on my nails. what are your favorite blue-teal-peacock shades? Black Ice is a definite must-have! And it looks gorgeous on you! I love black ice and divine pine. the others look a little on the black side so that I'd think the color would get lost without ample light. I love them all. I spotted them a while ago on Jessica's site. Unfortunately, they don't ship internationally (story of my life, boooh). So I'm waiting to find them somewhere else. I'm dying to get my hands on these. I have quite some bottles from previous collections and the formula was very nice. Let's see how I do with this one. I like all of these polishes on you. The green in divine. Divine Pine. I can't believe no other company has tried to rhyme that before. That means there is room for piney greens! Black Ice really appeals to me. It does have that ice on asphalt under the moon look about it. I love that you are not 'above' drug store polishes. Do you think you could swatch your Sally Hansen collection? Awesome, frost at all cost! In the UK this is a premium brand. Hard to get and available usually only if you get a professional manicure. Expensive. I had a fabulous pure red mani "Some Like it Hot". It lasted a long time but wasn't quick to dry even when done by a pro. So I can't comment on the consistency but I know my manicurist made a mess and had to clean me up. They do plentiful bottles but concentrate heavily on the reds and pinks. Very safe usually. However I did have a pedi which I didn't get the name of. How stupid was that??? Black only not black. We've all done it and that's usually not interesting but this one was. It may have been "Notorious".